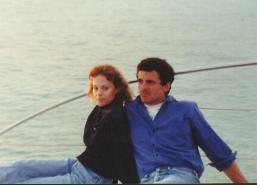 I spend a one-week vacation in December 1993 in the Florida Keys with a friend. We snorkel the coral reefs at three different locations. Thousands of brightly-colored (often iridescent) fish of all different shapes and sizes, crystal-clear water, and fabulous coral. Barracuda are everywhere. At first, it is rather unsettling to be swimming within 15 feet of them (a rumor I heard in high school was that barracuda have a frightful habit of biting off the testicles of men). Then I notice they only LOOK menacing, after which I start chasing them. I am so impressed by the whole thing that I plan to return for more. If you do not know how to snorkel, you MUST learn how so that you can have the experience of swimming in the coral reefs. To the left is a photo of the famous Bahia Honda—a beach that is consistently ranked as one of the best in the world, and just east of Key West. Bahia Honda is Florida's southernmost state park. Because of this geography, the natural environment at Bahia Honda is found no where else in the continental United States. The park has a number of biological communities, including beach dune, tropical hardwood hammock, coastal berm, mangrove forest, and submerged marine habitats. Rare and unusual plants here include yellow satinwood, manchineel, silver palm, Key thatch palm, and the endangered small-flowered lily thorn. Birds at Bahia Honda include white-crowned pigeons, great white herons, roseate spoonbills, reddish egrets, ospreys, brown pelicans, and least terns. In contrast to other Florida Keys, Bahia Honda boasts very attractive sandy beach along both the Atlantic Ocean and Florida Bay. An obligatory experience in Key West is Mallory Square dock. Each day, several people in Key West ritualistically gather at Mallory dock to watch the sunset and applaud when it sets, then turn to watch the highly popular street performers (buskers) on the dock. Pennekamp Park is a 54,000-acre underwater park. It is the first underwater state park in the United States and contains a portion of the only living coral reef in the continental U.S.
Below is a photo of me with my friend on a pleasant champagne sunset cruise near Key West on Christmas Eve with Stars & Stripes, which offers the cruise as part of their snorkeling package to Western Dry Rocks. 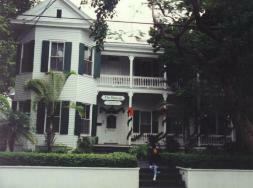 As was true in the past, we stay at a wonderful resort (The Banyon) while in Key West (see photo at right). Sadly, however, our para-sailing trip at Key West (water-skiing with a parachute) is cancelled due to wind. Next time. Bahia Honda, rated one of the world's best beaches, is very photogenic. 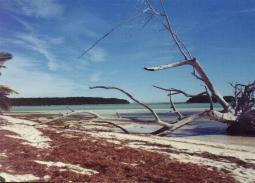 The warm Florida Keys climate provides year-round opportunities to use the beach. The Keys are botanically unique in North America, due to the tropical climate, waves, wind, and birds that carry tropical plants to the islands. The Florida Keys are home to the only living coral reefs in the U.S. It is also spiced up with many lagoons and turquoise ocean waters. The people who live in the Keys call themselves "conchs" (shellfish which is an important part of their cuisine), and their fiercely independent spirit almost led them, recently, to secede from the union under the moniker "Conch Republic." Key West is a mere 90 miles from Havana, Cuba. The average daytime high temperature is 82 degrees and at night, it is 73 degrees. Very pleasant, indeed. In fact, I enjoyed being in shorts during the December holiday season while hearing about blizzards in the rest of the country. Pirates were the first people to settle the Keys ("Keys" is a corruption of the Spanish word "cayos", meaning "small islands.") The U.S. Navy drove the pirates away in the 1820s. Settlers in Key West and Islamorada became wreckers, taking advantage of the many ships that would run aground on the reefs. As a result, Key West became the richest city in the U.S. Henry Flagler built a 130-mile long railroad, completed in 1912, from Homestead (on the mainland) to Key West. It took seven years of difficult work. In 1935, more than 40 miles of the railway was destroyed in a 200 mile per hour hurricane, which blew a train off its tracks, killing more than 600 people. The construction of the Overseas Highway was also a monumental feat – 113 miles of road and 43 bridges (one of them seven miles long). Big Pine Key is noted for its miniature Key deer, which are endangered due to such things as being killed on the Overseas Highway by cars. Key Largo is considered the diving capital of the world. Key West is a tropical Bohemia filled with "hippie" and "counterculture" people who apparently have come to the Keys to escape an undesirable U.S. culture. Indeed, Ernest Hemmingway (his house is a museum in Key West), Tennessee Williams, Robert Frost, and President Harry S Truman decided to live in Key West. John Pennekamp Coral Reef State Park contains more than 300 species of fish and more than 40 species of coral. Combined with the turquoise blue water and white sandy bottom, it is a snorkelers paradise. Looe Key offers what is said to be some of the most spectacular shallow-water snorkeling in the world. The nightlife in Key West, a city where approximately 30,000 people live, is spiced up with a number of street performers, a broad mix of musical types, open air cafes, bars, boutique, souvenir shops, and art galleries. It is an excellent street for strolling, and is called the longest main street in the world because it runs from the Atlantic Ocean to the Gulf of Mexico. Most of this action occurs on Duval Street in Old Town, which runs for eight blocks. The entire island on which Key West sits was easily explored by me and a friend on bicycle—the most popular form of transportation here (other than walking). I stroll through the Key West Cemetery, which contains many amusing statements on the monuments, such as "I told you I was sick." Another is a message from a widow to her husband: "At least I know where he is sleeping tonight."